This interview¡ªoriginally published on September 25, 2008, and again in 2012, on the occasion of the death of film critic Andrew Sarris¡ªis republished in conjunction with Museum of the Moving Image's complete retrospective of Howard Hawks films, screening through November 10, 2013. Andrew Sarris (1928¨C2012) was born the same year as Stanley Kubrick, a director he consigned to the category of "Strained Seriousness" in his seminal book The American Cinema. Sarris at first panned 2001: A Space Odyssey, incisively deriding its ending as "Instant Ingmar." Open-minded and self-deprecating, Sarris revisited the film (under the influence of marijuana, as recommended by some friends) and revised and upgraded his opinion. And few opinions have mattered more to cinephiles than Sarris's. In person, and as a Columbia film professor, Sarris loved digressions and ruminations. Yet though his style was somewhat informal, his intellect was rigorous and his love for cinema was unbounded. In this 2008 conversation with his wife, fellow film critic Molly Haskell, the couple discussed their mutual love for Howard Hawks, the ultimate auteur. Alas, Sarris's death may have robbed us of the pleasure of getting to read his long-promised but unfinished memoir The Accidental Auteurist. The following interview was published in September 2008. If Howard Hawks didn't exist, auteurist film critics would have had to invent him. He was the epitome of the idiosyncratic, existential artist who worked undercover, disguised as a competent craftsman with a clean, direct style. Hawks was equal parts entertainer and intellectual; box office receipts rewarded the former, critical insight revealed the latter. The paradox of Hawks was that he toiled anonymously within the genres and conventions of the Hollywood system yet imbued every film with his distinctive personality and a worldview that valued professionalism and the collaborative spirit above all. Not coincidentally, these two traits are essential to the filmmaking process, and the connection between Hawks's view of his own professionalism and that of his characters was clear to Andrew Sarris, who anointed the director as a member of the pantheon in his seminal book The American Cinema: "Like his heroes, Hawks has lived a tightrope existence, keeping his footing in a treacherous industry for more than forty years without surrendering his personal artistry." Just as Sarris explained and confirmed Hawks's stature as a great director, so did the textural richness of Hawks's entertainments confirm Sarris's stature as a great critic, and validate the very premise of auteurism. 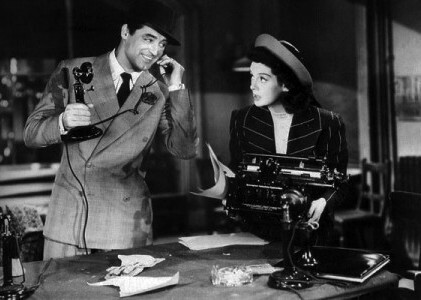 And fittingly, like Cary Grant in His Girl Friday and so many other Hawks heroes, Sarris found his match, and his companion, in a beautiful, confident woman who shares his profession. Molly Haskell emerged as a major film critic in the early 1970s, during the advent of women's liberation and feminist film criticism. While much feminist writing focused on new and overtly political films, Haskell blended aesthetics, politics, and an understanding of the depth and ambiguity of classic Hollywood movies. Also like Hawks's heroes, she was a bit of a tomboy, distinguishing herself in the hermetic world of film criticism, while writing lucidly about art and sexual politics. Of Hawks, she wrote, "The charge leveled by feminists that Hawks's women must model themselves after men to get their attention is largely true. For one thing, his men are somewhat retarded in the process of learning how to deal with women. But the behavior of his tomboys and bachelor girls is also an explicit challenge to traditional stereotypes of what a woman is and should be. Their aggressiveness arises from a variety of motives and instincts, from ambition, energy, intelligence, sexual insecurity, and from a frustration, perhaps, from being so long excluded from the world of action and camaraderie and non-sexual love that Hawks's cinema celebrates." Sarris and Haskell live in a spacious Upper East Side apartment with a magnificent view of Central Park; they talked recently with David Schwartz, Chief Curator of the Museum of the Moving Image. On a desk in the living room, next to a large window, sits a small manual typewriter, on which Sarris still bangs out his reviews. (Haskell uses a computer, and even maintains her own website). The surroundings may be glamorous, but their lives are still rooted in cinephilia. When the topic of Hawks's and John Ford's respective work with John Wayne came up, Haskell says that she and her husband had just been discussing the subject over breakfast. And if film critics Andrew Sarris and Molly Haskell didn't exist, Howard Hawks would have had to invent them; a garrulous, witty cinephile who became a paragon in his field, a woman who could match him insight for insight, and distinguish herself in an enclosed, nearly all-male world. SARRIS: He was successful, but he wasn't prestigious. SARRIS: I think he was only nominated for one Oscar, for Sergeant York. And he never won an Oscar, of course. The first time I heard about him was when my friend Eugene Archer, went to Paris in the 1950s on a Fulbright. He wrote me a letter and said, "Who the hell is Howard Hawks?" He had signed a contract for a book that he was going to do about six directors: Elia Kazan, John Ford, George Stevens, and so on. The Cahiers people said, "Ugh! What about Howard Hawks and Hitchcock?" And so he wrote me this letter; it's the first time I heard anybody being so high on Hawks. I had seen a lot of Hawks's movies in revival houses, so I was really up on him. But I couldn't quite get him, because he had so many different genres. And that's what the French loved about him, precisely. Because for instance, Hitchcock would never do a western or a musical. And then Dan Talbot ran a Hawks festival at the New Yorker Theater, and I wrote something about it. And I was writing for little publications. And another thing, it was sort of an accident of film history. Robert Warshow wrote "The Gangster as Tragic Hero," and he wrote about Little Caesar and The Public Enemy but he didn't write about Scarface, because Scarface was not in general circulation for many years. It was a Howard Hawks picture, and the French had been on Scarface's trail since '32. So it was not just the Cahiers people. Even before Cahiers, Hawks was admired for Scarface. And all the other 1930s adventure films. But here in America, even Warshow didn't know about Scarface. In fact, I hadn't seen it when I was writing all these Hawks articles; it still wasn't available. I only saw it very much later. HASKELL: When I came in was the 1960s, when there was a shift in critical discourse and Bosley Crowther was on his way out at The New York Times. And so it was a hipper critical scene, and there were more revivals. But there was still disagreement. I mean, Pauline Kael was not enthusiastic about Rio Bravo, and even less so El Dorado. SARRIS: Well, it was part of her thesis, that we auteurists were so unsure of our own manhood that we loved these tough men! HASKELL: Except they're not so tough. It's the same theme as in Hawks. The men were a little bit worried about their manhood. I mean, that's what's so profoundly American, so enduring about them, is the sexual politics, the gender problem. And of course, in the late 1960s I was getting involved in what was then called women's liberation. And I just loved Hawks. And some feminists didn't, or those few feminists that were also interested seriously in film¡ªthere didn't seem to be many that were in both groups¡ªfelt that they were just sort of honorary men, that the Hawksian woman was just a sort of pretend male. This was a division about whether there was some essentialism, femaleness, and whether women had to be womanly. But I mean, I just responded to that whole tomboy thing, especially in the screwball comedies, but also the westerns. And I really grew to love the westerns, which actually do change over the years. And I think there's something very modern, if you look at all these Judd Apatow films, about the allure of irresponsibility and never wanting to grow up. In fact now, there's just a celebration of never growing up, or at least a complete comic indulgence in it. Whereas in Hawks, there is this sense that you do have to evolve, you do have to grow up, and it's a perilous journey. The male/female sexual struggle is much scarier than any bad guy lurking in the saloon, you know? And you always feel like Hawks doesn't totally believe in growing up. I mean, the end of Bringing Up Baby, when Katharine Hepburn destroys the dinosaur, and she is hanging there with Cary Grant. SARRIS: Well, Bringing Up Baby, in its own time, was a big flop, because it was just nonstop zaniness. Cary Grant has this great line in it, "You know, Susan, in quiet moments, you're what I would call very attractive. But there haven't been any quiet moments." [They laugh] So that was the trouble, there were no quiet moments in that. You know, most screwball comedies have a romantic, sentimental side. And they tend to lead towards order at the end. Hawks liked the anarchy better. HASKELL: He did. And his endings don't really resolve anything. One thing that struck me about Hawks and his depiction of women is something that you wrote, that women are not objects in the films; it's not subject and object. So if you compare Casablanca, where Ingrid Bergman is the object of desire for the film, to To Have and Have Not, which almost pretends to be a remake of Casablanca, Lauren Bacall is a different type of woman. SARRIS: Well, I think she's one of the strongest of all. Hawks didn't like Bogie. He said he was the most insolent man he'd ever met and he was going to get a woman that was even more insolent than he was. HASKELL: Plus they had this relationship. So she is probably the most autonomous and active equal to the man in any Hawks film. But that is the prototype of the Hawksian woman, the deep voice and the smoking and the drive and the little bit of mannishness, or at least androgyny. And sometimes the women intervene in the male bonding, and they're just sort of poor substitutes. Only Angels Have Wings was one that, at first, I didn't like. I felt that the Jean Arthur character was sort of pathetic and a hanger-on, and the men didn't really want her around. And that really bothered me. And then I saw it more recently, and I loved it. But there's a strong streak of self-pity, of male self-pity, and a little bit of, yeah, "I don't want to grow up. Don't make me grow up. And you're a bad woman for making me grow up." Forcing the blame, projecting all the blame on women. But on the other hand, there are all these striking boisterous, interesting, ballsy women. So why did Only Angels Have Wings seem better now? What was it about Jean Arthur's character that changed for you? HASKELL: Well, I think first of all, I think this is true of anything to do with feminism. I think so much has happened. I mean, right now, even in politics, there suddenly are really¡ªit's really a question of numbers. There're just more women out there. So each woman doesn't have to represent so much, and you don't have to feel angst over each, you know, portrait of woman that you feel is in some way humiliating or degrading. Plus, she really is so good in it and so warm. And you know, when you're leading with your politics, as I was sometimes in those days, it obscures other qualities. And then the politics sort of subsides a little bit, and the other qualities emerge. SARRIS: Apropos of nothing at all, I just remembered a funny thing. Hawks was talking about a scene with John Wayne and Angie Dickinson in Rio Bravo. And John Wayne says something very cutting, very full of attitude towards her. And Hawks said, "You know, Wayne can't get away with that. I mean, he can't do that. He can't really project this kind of superior feeling. But Bogart can. Bogart can really insult a woman. He can really, you know, take her apart. But Wayne just¡ªyou know, he's too repressed to do that." HASKELL: Well, he's gentler, really. SARRIS: Yeah, he's much gentler. SARRIS: And they love Bogart. HASKELL: ...they love Bogie. But Bogie is much more macho and arrogant in every way. And Hawks really found that side in John Wayne, who is an underrated actor. SARRIS: He told Ford to look at Red River and see how deep Wayne could go. And so from then on, Ford began using Wayne in a much more thoughtful way. Hawks is all about acting. That's to me what's great about Hawks, the whole idea that everything is a performance. HASKELL: It's not about introspection or internal conflict. Everything you are is out there, is externalized. Also Hawks really brings out the feminine side of the men. We've talked about the masculine side of the women, but there's the feminine side of the men. That's in Cary Grant and in John Wayne. I think Manny Farber talked about that. Or at least he talked about Hawks's feminine touch or something. That's why there's sexual tension or excitement. I think there is this awareness of the feminine side, and maybe a little nervousness about it. Hawks's style is known as being invisible. So to compare him to Hitchcock, where the style is so obvious, what would you say is great about what Hawks is doing? Because he works within genre yet manages to put his personality in everything. But it's a little bit elusive to describe exactly what he's doing. SARRIS: Well, one aesthetic thing that he stated in an interview, a very revealing interview with a French critic, was that he photographs everything from an eye level. In other words, there are no big overhead shots. You know...little men, big world shots. HASKELL: Or no Wellesian shots. SARRIS: Full of nobility and stature. He has everybody equal, he has the camera in the center of the action. HASKELL: It's because man is the measure of all things. There's no Christian side of him where it's the afterlife; everything is now. SARRIS: He doesn't like to use long periods of time. He does, in a limited extent, in Red River and a couple of other films. But generally speaking, when he has a choice, he likes to keep it in a short period of time. HASKELL: In other words, there's no immortality. It's how your peers regard you and approve of you. And there's something very ancient about that. It's almost like a Greek, pre-Christian ethos. And that's why you have group shots. You're not in isolation. You are always interacting. HASKELL: They're small¡ªthey're little microcosms, they're families. They're little surrogate families. SARRIS: Hawks was the anti-Capra. Capra did have social relevance, which is why he was much more highly regarded at the time. And now a lot of it seems very sticky and sentimental. HASKELL: And much more rooted in a particular period, whereas Hawks is more modern. SARRIS: And he gets away with these limited means. Another thing I've told students about Hawks is something that you don't see anymore¡ªthe same thing with Sturges¡ªhow fast the people talk. That keeps the films shorter, because they get the scenes done much quicker than nowadays, when, in this post-Method period, everybody has to look away a few times and feel it before they let it happen. HASKELL: And maybe they're not the most artistically successful either, but they're interesting, and daring in their own ways, without necessarily being subversive of the Hollywood system. It's hard to teach Hawks because of his invisible style, I think. Because he just gets on with it. That can also be deceptive. There's a lot going on that's not obvious, because of this kind of transparency. Well, that's why they called it the politique des auteurs. It was about making a statement. HASKELL: Overturning sacred cows and all that, yeah. Do you think that one thing that the French latched onto was a kind of existentialism? I mean, it is sometimes said about Hawks that he has this intuitive existential view. HASKELL: Yeah, very much so. Yeah. I mean, because they all are facing death in one way or the other. And that's a given, even in the comedies. And this is the other thing, of course, is how interrelated the comedies and the tragedies are, and the tragedies are full of comedy and the comedy is tragic. What do you think of some of the later Hawks? So much attention was paid to the pre-1960 films, up to Rio Bravo. The 1960s films don't have a great reputation. SARRIS: Well, Man's Favorite Sport?, Hawks would've loved to have Cary Grant for that. And with Grant, it might've been a hit, but with Rock Hudson, it didn't quite work. HASKELL: And Paula Prentiss. But I like her in it. I mean, she's not a big box office star. But I like that film. I can see why the audiences didn't, but I think it's really interesting. It cuts really to the chase of his sexual politics. I like El Dorado a lot. Rio Lobo, I haven't seen it recently, I don't know. Do you remember Rio Lobo? SARRIS: It's not as developed as Rio Bravo. HASKELL: What is interesting, of course, is that in the earlier films, there's always a thing where the main character humiliates the wounded man...a castration thing. But the later films are much more forgiving, and as Hawks is getting older, his actors are getting older. They're much more communal, I think. They were much less heroic and more communal. And is there a Hawks film that holds up the best today? Or that you would say was your favorite? SARRIS: Well, Twentieth Century is remarkably good, very sharp. And it's very precious because it's really John Barrymore's last great performance. I mean, before drink just killed his reflexes. But you could see he's a great actor in this film. HASKELL: One interesting thing is, except for Bacall, he never used the same women. He used the same men over and over again. And the women only once, which is sort of a typical male thing; you have to always have fresh meat, just like you [to Andrew]. Always looking for new female faces. HASKELL: Yeah, and Gentlemen Prefer Blondes is one of his best, I think. That's a great film, and completely different. A different genre for him, but not different fundamentally. Do you think it's possible these days to have a director be discovered like Hawks was? Now directors sort of come out self-announced as being great directors. HASKELL: As directors. "A film by..." right off the starting block. No, there's no discovery now. The discovery now maybe would be on television.